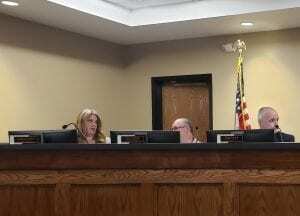 JASPER, Ga.- The Pickens County Board of Education met on Thursday, March 14, 2019, for their regular board meeting. During the first half of the meeting, several individuals were presented with awards on behalf of Pickens Middle School and Pickens High School. 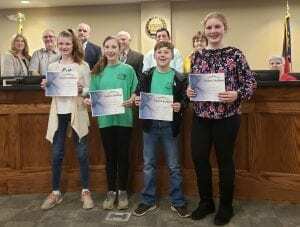 Pictured left to right, Ellie Hollis, Eva Stanley, Grayson Ludington, and Addison Lewis of Pickens Middle School. The first was an award for the Science Fair. On Saturday, February 2, 2019, four Jasper Middle School students, all in the sixth grade, competed in the Regional Georgia Science and Engineering Fair (GSEF) against sixth to 12th graders. These students, pictured left to right, are Ellie Hollis for placing third in Plant Science, Eva Stanley for placing third in Chemical Energy, Grayson Ludington for placing second in Behavioral and Social Sciences, and Addison Lewis for placing fourth in Earth and Environmental Science. 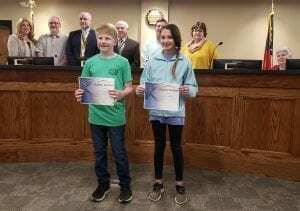 Pictured left to right, Micah Newton and Ellison Steinhauer of Pickens Middle School. The second award was for the Social Studies Fair. On Saturday, January 12, 2019, two Jasper Middle School students, both in the fifth grade, competed at the North West Georgia Regional Social Studies Fair in Kennesaw, Georgia. These students, pictured left to right, are Micah Newton for his project on the Dangers of Vaping and Ellison Steinhauer for her project on the Vietnam War Draft. 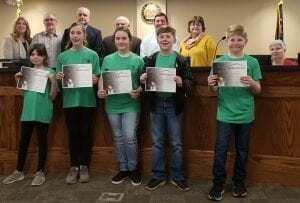 The third award was presented for the Helen Ruffin Reading Quiz Bowl Competiton in which Jasper Middle School fifth and sixth graders took third place against regional middle schools with sixth, seventh, and eighth graders. The fifth graders to receive this award were Ashlyn Zipse, Emily Caro, Micah Newton, and Gracie Thompson. The sixth graders to receive this award were Emily Coley, Isabel Johns, Grayson Ludington, Eva Stanley, Addy Wood, and Cody Caro. Pictured from left to right are Thompson, Stanley, Coley, Ludington, and Newton. Dr. Robert Keller of Pickens High School. The final award of the night, the “Dragon Nation Enduring Flame Award” was presented to Dr. Robert Keller for his outstanding contributions to Pickens High School. Congratulations from Fetch Your News to all who received recognition during this Board of Education meeting! 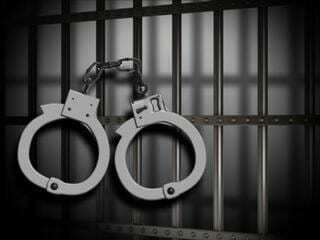 « Previous Article Veterinary Emergency - Are you Prepared?